Ahead of the centenary of the end of the First World War, Archive Assistant Sarah Ensor tells us about one record of how Essex people remembered their lost loved ones. Discover more First World War stories of Essex people and places on Saturday 10th November 2018 at ‘Is this really the last night?’ Remembering the end of the First World War. This month is the centenary of the end of hostilities of the Great War. To some the Armistice was a reason for joyous celebration, but for the many who had lost loved ones it was a time tinged with sadness. The ultimate sacrifice made by people throughout the conflict was marked in many ways such as on stone war memorials in villages and towns, on memorial boards in schools and councils, and on plaques in churches and businesses. The Reverend Robert Travers Saulez had been rector at St. Christopher’s in Willingale Doe from 1906. He and his wife Margaret had four children, three sons and a daughter. Their sons were all educated at Felsted School and then joined the army, serving overseas during the Great War. Their middle son, Arthur Travers Saulez, was a major in the Royal Field Artillery and mentioned twice in Dispatches, before he was killed at the Battle of Arras on 22 April 1917. This service register for St Christopher’s, Willingale Doe,(D/P 338/1/14) shows that almost exactly one year later at 3.15pm on 22nd April 1918 a window in the church was unveiled in his honour, erected by the officers, NCOs and men of his Battery. The Illustrated London News of 8th June 1918 mentioned that it was the first representation of a man in khaki in stained glass. This entry from the service register for St Christopher’s, Willingale Doe, records a service to unveil a window in memorial to Major Arthur Travers Saulez on 22 April 1918, a year after he was killed in the Battle of Arras. Arthur’s father, Revd. Robert Travers Saulez, was the parish’s rector. Memorial window to Arthur Travers Saulez at St Christopher’s church, Willingale Doe. It was reported at the time to be the first image of a man in khaki military uniform made in stained glass. Image by Paul HP on Flickr. Arthur Saulez was aged 33 at the time of his death. His younger brother, Alfred Gordon Saulez, died in Baghdad while serving with the Army Service Corps in 1921, aged 35. The Saulez brothers had maintained a correspondence with family members back home during the war and these form part of a collection held at ERO (D/DU 2948). We are grateful to the Friends of Historic Essex for acquiring the Saulez collection as part of the Essex Great War Archive Project and for subsequently paying for the cataloguing, conservation and storage of the letters. If you wish to find out more about this charity that supports the Essex Record Office please see their website. 250 years ago, on 25 August 1768, Captain James Cook of the Endeavour embarked from Plymouth on his first voyage of discovery to the South Pacific to observe the transit of Venus. In so doing, he left behind Elizabeth his wife of nearly 6 years and their first 3 children. It has been calculated that the couple spent a total of just four years together out of 17 years of marriage. Record of the marriage of Captain James Cook to Elizabeth Batts in 1762 in the Barking parish register (D/P 81/1/10). Both have signed their names; the fact that Elizabeth was literate enough to do so is an interesting detail. This month’s document, a marriage register (D/P 81/1/10), records their marriage at St Margaret’s church, Barking on 21 December 1762. James Cook lived further up river at Shadwell and Elizabeth (née Batts) was the daughter of the inn-keeper of The Bell at Wapping. Cook was fourteen years older than Elizabeth who was aged just twenty. As neither of them belonged to the parish of Barking, they were married by licence of the Archbishop of Canterbury by George Downing, the vicar of Little Wakering in Essex (it is thought that Elizabeth Batts knew Downing who was also chaplain of Ilford Hospital). Altogether, they had 6 children, three of whom died in infancy. Of the others, two went to sea like their father. Nathaniel was lost aged sixteen in 1780 in the Thunderer, which foundered with all hands in a hurricane in the West Indies, and their eldest James (a commander and the longest lived) was drowned in 1794 whilst trying to board his sloop in a storm. Meanwhile, their youngest, Hugh, died of scarlet fever in 1793 aged seventeen whilst he was a student at Cambridge. James Cook, of course, was murdered by enraged natives in Hawaii whilst on his third and last voyage in 1779. Consequently, there are no direct descendants of James Cook. So, Elizabeth Cook was not only a widow but had lost her whole family by 1794. And she was to outlive them by another 40 years as she died aged ninety three in 1835 and was buried alongside her sons, James and Hugh, in the church of St Andrew the Great in Cambridge which contains a monument to the whole family. The register will be on display in the ERO Searchroom throughout October 2018. If you are interested in finding out more about Captain Cook and Elizabeth Batts, you might want to take a look at another document in our collection – an essay by Derek Simmans entitled ‘The mystery of the marriage of Captain James Cook to Elizabeth Betts [Batts] on 21st December, 1762’ which is catalogued as T/G 437/3, and which you can search for on Essex Archives Online. New fragments which tell us about Essex’s past come in to us all the time, in all shapes and sizes. Here, Archivist Ruth Costello tells us about one of our new additions – a beautiful survey of the Rivenhall estate. The volume bears no date, so Ruth has been sleuthing to see if she could find out when it was made. This month’s document is one of two volumes of maps which we received earlier this year as part of accession A14956. This, the smaller of the two, shows Rivenhall Place and its lands, which were owned by the Western family. For each part of the estate, there is a carefully drawn map, and a list of how each parcel of land was being used. This map shows Rivenhall Place and the lands immediately around the grand house. Despite its undoubted beauty, it seems to have been treated as a working document, with annotations in pencil, some of which seem to have been rubbed out at a later date. Unfortunately, the survey does not include a title page, where we might expect to find the name of the surveyor. Nor does it include a date. We knew the volume must predate 1839 as the Rivenhall tithe map produced in that year clearly shows the newly built Eastern Counties Railway running through the parish. In the volume, it has been pencilled in at a later date (it’s the line crossing through the meadow land numbered ‘23’, north of Rivenhall End in the page on display). We already held two maps of Rivenhall Place among the Western family estate records drawn in 1828 and 1839 (this latter one didn’t show the railway, so must have been produced earlier that year). It’s unlikely that the land would have been surveyed and mapped on another occasion, so we thought that the volume must tie in with the date of one of these maps. On display in the ERO Searchroom, the volume is opened to display the map of Pond Farm, which at the time was leased (somewhat appropriately) by Joseph Lake. Both the volume and the 1828 map (D/DWe P12) show a property described as ‘workhouse land’ (it’s surrounded on two sides by the field numbered ‘26’). The later map of 1839 (D/DWe P16) has the name ‘Bilney’ against this property. It would seem that Mr Bilney bought the property after the Poor Law Amendment Act of 1834 led to the sale of former, smaller parish workhouses and the creation in this case of the new Witham Poor Law Union workhouse. Some of the surrounding area is described as ‘William Blackborne’s land’. We found a burial for a William Blackborne in the Rivenhall parish register in 1825. Initially this made us think that the volume must predate his death and must be earlier than 1825. However, both the 1828 and 1839 estate maps also included his name, which showed that out of date information was being copied forwards. We think, therefore, that the volume and the 1828 map we already held were drawn at the same time. Sadly, we still don’t know who drew them; the map also has no author. The map shows the whole of the estate and its individual farms together, but it has only a very little colouring, by comparison with the volume. This volume and its companion (a series of maps of the Felix Hall estate) are thus a welcome addition to our holdings. The volume will be in display in the Searchroom throughout September 2018. 100 years on from the establishment of the Royal Air Force (RAF) in April 1918, we have chosen this photograph of Stow Maries Aerodrome during the First World War as our Document of the Month (T2603 Part 22). Stow Maries Great War Aerodrome, near Maldon, is considered to be the best preserved First World War airfield in Europe. Its 24 original buildings are Grade II* listed, and today a major project is working on restoring and interpreting the site for visitors. Powered flight was still a very new phenomenon during the First World War; the Wright brothers had made the first powered flight only in 1903. Despite the fact that the aircraft of this time were flimsy, dangerous, unreliable and uncomfortable, in 1912 the British army had established the Royal Flying Corps (RFC), and in 1914 the Royal Navy formed the Royal Naval Air Service (RNAS). On 1 April 1918 these two services were combined to form the RAF, the world’s first independent air force. Aircraft were used on the battlefields, initially for reconnaissance and then as fighter planes and bombers, but they were also used for home defence. From early 1915 the Germans began air raids on Britain, first with Zeppelins and later with Gotha planes. From late 1915, Home Defence Squadrons were formed to defend against this threat. One of these was No. 37 Squadron, formed in September 1916. Its HQ was at Woodham Mortimer, and it had three flights, based at Stow Maries, Rochford, and Goldhanger. The job of the Squadron was to help defend the eastern approaches to London. The first commander of Stow Maries was Lieutenant Claude Ridley, MC, DSO. Despite being aged just 19, Ridley had already served with the RFC in France and on home defence airfields. He earned his Distinguished Service Order when a mission to drop a spy behind enemy lines went wrong, and he ended up trapped on the German side. Despite having no command of either French or German, over the course of several weeks he managed to evade capture and made his way to the Netherlands. Not only did he survive to escape, he collected information on enemy activity along the way. He was no longer allowed to fly in France as it was judged that if he had crashed behind enemy lines again he would be shot as a spy, so he was assigned to home defence duties and put in command of Stow Maries. Stow Maries was operational as a home defence airfield between May 1917 and May 1918, with 81 sorties flown to intercept enemy aircraft. At its height there were 219 staff based there, 16 of whom were aircrew, and 20 of whom were women. During this time, 10 members of 37 Squadron were killed, 8 of them in accidents (which goes to show just how dangerous flying was at this time). Initially the airfield was equipped with BE12s, which were too slow to keep up with the German planes. Eventually it was sent Sopwith Camels and Avro 504ks, which are the planes which can be seen in our photograph. The Sopwith Camel was the most famous British fighter aeroplane of WW1 and was first introduced on the Western Front in 1917 (the beginning of the video below shows one being started up and taking off). The Camel, so-called because of the hump-shaped protective covering over its machine guns, shot down more enemy aircraft than any other Allied fighter plane during the First World War. The Avro 504k is one of the greatest training aircraft ever built. It was used to equip training units first in the RFC and later the RAF. Always knows as a training aircraft, Avro 504ks were also used as an emergency home defence fighter operating against German aircraft raiders. Stow Maries continued as an aerodrome until Spring 1919, after which the site was returned to agriculture. Many of the buildings constructed during the First World War for use by the RFC and RAF survive today, and Stow Maries is now undergoing a major conservation project and is open to visitors. The photograph will be on display in the ERO Searchroom throughout April 2018. March 2018 marks 200 years since the death of one of England’s most influential landscape gardeners, Humphry Repton. To mark this, we have chosen for March’s Document of the Month Repton’s ‘Red Book’ for Stansted Hall, commissioned in 1791 by William Heath (D/DQ 29/1). Repton worked as a design consultant, visiting his clients’ properties and making suggestions for how picturesque views might be created within the landscape. He is best known for his ‘Red Books’ – reports he created for his wealthy clients which outlined his suggested changes, bound in Morocco leather. These books include beautiful watercolour sketches with flaps that can be lifted to show the views before and after Repton’s proposals. The Red Books served a dual purpose; they showcased Repton’s ideas to his client, but they might also be shown to admiring friends and hopefully secure further commissions. In the book for Stansted Hall Repton sets out suggestions for creating what he considered would be picturesque views from and towards the house. His first observation was that the house was rather sprawling, and suffered from an unbalanced appearance due to one of its four towers being shorter than the other three. He recommended that the house should not be extended any further, but that the smaller tower should be built up to match the others, and the sprawling buildings to the side be concealed with planting, allowing a cupola or clock turret to peek up above the trees. The Stansted Red Book includes one of Repton’s famous ‘lift the flap’ pages. With the flap down, we see a watercolour of the house as it stood. …to reveal to the client the changes Repton was proposing. In this case, the building up of the shorter tower to match the others, and concealing part of the building with planting. Repton also suggested covering the red brick building in a grey-white stucco wash, due to his ‘full conviction how much more important as well as picturesque a stone coloured building appears than one of red bricks … this alteration will [also] have a prodigiously pleasing effect from the turnpike road’. I call the Lawn immediately surrounding a mansion by the name of Park, whether it supports deer or other stock. This sort of Park does not take its consequence from real extent, but from its supposed magnitude, and chiefly from its unity, or the appearance of all belonging to the same proprietor: high roads, hedges & houses belonging to other persons near the Mansion, always tend to lessen its importance, while plantations increase it. To this end, Repton suggested concealing the vicarage which was near the hall with a plantation, and rerouting the approach road to carefully craft the views seen by visitors as they arrived. Landscape gardening was not the career that had been intended for Repton. He was born in 1752 in Bury St Edmunds, the son of an excise collector. His parents had 11 children; Humphry was one of only 3 who survived infancy. He attended grammar school in Bury St Edmunds, and then in Norwich when his family moved there when Humphry was 10. Intended for a career as a merchant, at age 12 Repton was sent to live with a wealthy family in the Netherlands to learn Dutch and French. Returning to Norwich aged 16, he was apprenticed into the textile industry. He was, however, more talented in the arts than in trade, and was not a successful businessman. In 1773 he married Mary Clarke, and having inherited some money he retired from business and set himself up in the north Norfolk countryside to live the life of a gentleman. After a few years, however, the money was running out. In 1786 Repton moved his family to Hare Street near Romford, and turned his skills at sketching and writing to a career as a landscape gardener. His favourite commissions were from the established gentry and aristocracy, when sometimes he would be invited to stay at his clients’ grand houses. A large proportion of his work, however, was for villas of the nouveaux riches around London who had made their money in business and trade. By the end of his career, Repton believed he had prepared over 400 Red Books and reports, including for several properties in Essex. In addition to his work for private clients, Repton also published treatises on the principles and practice of landscape gardening. These helped to secure his reputation and his influence on the field of landscape gardening. Repton’s career had a rather sad end. Commissions became fewer and further between, something he blamed on the effects of the Napoleonic Wars, with new taxes and dramatic inflation reducing the amount of money the wealthy had to spend on luxuries such as landscaping. In January 1811 the carriage he was travelling in returning from a ball overturned on an icy road and Repton sustained serious injuries from which he never fully recovered. He continued to work, visiting sites in his wheelchair, often in great pain. He died on 24 March 1818 at Hare Street, and is buried at Aylsham church in his beloved Norfolk. The Stansted Hall Red Book will be on display in the ERO Searchroom throughout March 2018. As many of us return from visiting family and friends over the Christmas and New Year period, it’s interesting to look at a document from a recent deposit of records to see how one family recorded their visits to and from relatives. These pages are from an album which was used as a combination of an autograph book and a visitors’ book and belonged to one of the Ruggles-Brise family of Finchingfield (Accession A14635 box 19). It seems to have been taken with the family on visits, as well as being used at the family home of Spains Hall. The left hand page shows a photograph of Keswick Hall in Norfolk (the home of Agatha Gurney, who later became Agatha Ruggles-Brise). Members of the family clearly stayed there in January 1903, but remained at Spains Hall in January 1904. Most of the signatures are by members of the Ruggles-Brise family, including the then owner of Spains Hall, Archibald Weyland, his wife Mabel, some of their children, his brother Harold and sister in law Dorothea. Does this sketch of ‘The Cake Walk’ show a dance move done by the guests at Keswick Hall celebrating over New Year in 1903? It’s not clear who is the rider shown falling head first off her horse in the rather alarming sketch. The self-portrait of a Guardsman is signed as Alan G. Tritton, who we know lived nearby at Lyons Hall, Great Leighs. It is sobering to see this, knowing that the author of the jokey little drawing was killed in action ten years later in 1914. This accession is one of just over 200 received by the Essex Record Office last year. Some may consist of a single photograph and are available promptly to order via our online catalogue; others (like this deposit) may run to a large number of boxes. Work is currently underway to identify, list and box the records, and when this work is complete it will be made available to researchers. The autograph book will be on display in the ERO Searchroom throughout January 2018. Our Document of the Month for December is the will of Dorothy Christmas of Chelmsford, dating from 1644 (D/ABW 58/39). Dorothy was the wife of Peter Christmas, an inn-keeper at Chelmsford, whose will of 1639 we also have showing that he left most of his estate to his widow. The couple seem to have had no children. ‘Christmas’ is very much an Essex surname and indeed Reaney, in his Dictionary of British Surnames (1958), traced the name back to one ‘Ralph Cristemesse’ living in Essex in 1185. Of course, the name has several variants, such as Chrismas or Crismas, which are scattered across Essex but perhaps with a concentration in the villages around Colchester in the north east. National newspapers, such as The Daily Mail in December 2014, have already noted the record in a parish register we keep here at Essex Record Office of the burial of ‘Father Christmas’ at Dedham in 1564. Not much is known from his will what Peter Christmas left his widow but there is much more detail in Dorothy’s will about what she gave to her relations, her brother and several cousins, as well as some ‘loving friends’. From it, we get a good idea of what her life was like from the ‘goodes’ and ‘chattells’ described; for example, how comfortable the beds were in her house (or ‘shoppe’), with their feather pillows and bolsters and flaxen sheets and coverlets. Like most early wills, the opening statement beginning ‘In the name of God Amen’, reflects the piety of a former age. In particular, references in this will to Jesus Christ, the ‘alsufficient Saviour and Redeemer’ and the assurance of having one’s sins forgiven and being ‘made partaker of his heavenly Kingdom with the Elect’ reflect the beliefs promoted by Luther and Calvin during the Reformation. In 2017, we look back to the beginning of the Reformation 500 years ago, and in doing so, perhaps we might also reflect upon the religious significance that Christmas had for all those who lived at that time. Dorothy’s will will be on display in the ERO Searchroom throughout December 2018. Our Document of the Month for October tells of a dark happening. It is a letter written in 1713 that tells the tale of a ghost sighting. The letter was written by Nicholas Jekyll of Castle Hedingham to Rev. William Holman of Halstead (D/Y 1/1/111/19). It is one of about 200 letters from Jekyll to Holman which are today at ERO, the earliest dating from 1711 and the latest to 1730. Holman was collecting materials to write a history of Essex, and Jekyll was helping him by supplying information and commenting on his manuscripts. They did, however, sometimes correspond about other topics. In some letters Jekyll thanks Holman for gifts such as bottles of brandy and homemade elderberry wine, and in others discusses current affairs, or gives updates on members of his families who have emigrated to America. This letter begins with mention of a book Jekyll was returning to Holman, and a request by Holman for Jekyll to do some research for him. The majority of the letter, however, describes the sighting of ‘an apparition of that wretched poor fellow who lately drowned himself’ near Jekyll’s house. Initially Jekyll was scornful of the report of ghost sighting, but believed he now had ‘unquestionable proof’ that it was true. The apparition had been seen ‘acting like a fellow in deep melancholly [sic]’ in the place where the man had drowned himself, before throwing itself into the water. The letter will be on display in the ERO Searchroom throughout October 2017. 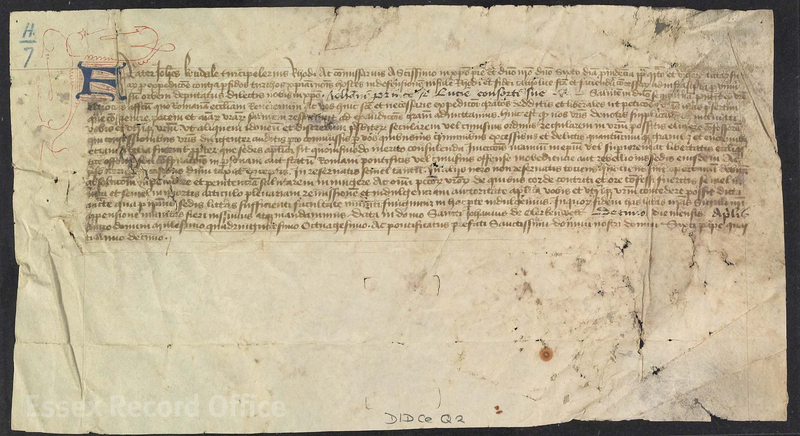 Our Document of the Month for August 2017 is a medieval indulgence – a certificate granted by the Catholic Church to absolve the bearer of sin, and reduce any punishment they would receive either in this life or in purgatory. The document dates from 1480, but we have chosen to highlight it in 2017 because this year marks 500 years since Martin Luther’s publication of his Ninety-Five Theses, an event which is generally seen as the beginning of the Protestant Reformation in Europe. The Ninety-Five Theses is also known as the Disputation on the Power of Indulgences, and criticised the way the Catholic Church was granting these documents. Indulgences had originally been intended to be a reward for piety and good deeds, but the system had become increasingly commercialised, with indulgences being sold. In 1517 Pope Leo X offered indulgences to those who contributed alms towards the rebuilding of St. Peter’s Basilica in Rome. In Germany a Dominican friar, Johann Tetzel, was prominent in selling indulgences and the saying ‘As soon as a coin in the coffer rings, a soul from purgatory springs’ is attributed to him. Luther attacked the sale of indulgences not only for their commercialisation, but also because he contended that the Pope had no right to grant indulgences on God’s behalf. He also argued that the selling of indulgences discouraged people from truly repenting of their sins or performing acts of mercy. This particular indulgence was granted to John and Lucy Prince, ‘in consideration of [their] devotion to the Roman Church and willingness to aid the sacred and necessary expedition against the perfidious Turk and for the defence of the Isle of Rhodes and the Catholic Faith’ [Suarum pro expeditione contra perfidos turchos christinai nominis hostes in defensionem insule Rhodi et fidei catholice facta]. The indulgence was granted by the Knights Hospitallers of St John of Jerusalem, at their English headquarters of St John’s Priory in Clerkenwell. The Knights Hospitallers were a religious and military order charged with defending the Holy Land. Having been based originally in Jerusalem, by this time they had bases across Europe and operated their military activity from the island of Rhodes. In 1480, the year this indulgence was granted, the Ottomans under Sultan Mehmet II laid siege to Rhodes; granting indulgences was one of the ways the Knights Hospitallers raised money for its defence. Mehmet II had been waging a largely successful campaign against Christian forces since 1453 when he captured Constantinople (Istanbul). Rhodes did not fall until 1522 when it was captured by Suleiman the Magnificent, Mehmet’s great-grandson. The indulgence gave the Princes the right to choose their own confessor with the power to absolve all sins, other than murder of a priest, violence against a bishop or disobedience towards the Pope. It also granted the right for a full remission and indulgence of sins once during their lifetime and once at the point of death. The Protestant Reformation centred round the principle that salvation could be achieved by faith alone, not by faith and good works, as emphasised by the Catholic Church. In this Luther built on the works of humanists such as Erasmus. The subsequent emphasis on translating the Bible from Latin into the vernacular (i.e. English) was intended to make it more accessible to everybody. These principles resonated across Europe in the 16th century, and we can find evidence of them in the ERO collections. In 1588, for example, John Brockise of Havering Green, Hornchurch, a painter, left a will (D/AEW 9/10) in which he bequeathed his most precious possessions. After bequests of furniture to his children, he left to Samuel Brockis the Paraphrase of Erasmus on the Four Gospels and the Acts of the Apostles ‘in consideration that he shalbe good to my wife and to the reste of his bretherne and sister after my desese’ or his wife had the power to withhold the bequest. He left to his son Robert ‘one bybell’ translated by Miles Coverdale on the same basis. Miles Coverdale first translated the Bible into English in 1535. So this one little document which is today looked after as part of the collections at ERO is a small part of a big story about a transforming world. We will not ever know what sin John and Lucy Prince felt they needed an indulgence for, but in the world of medieval Catholic belief it was better to be safe than sorry. The indulgence will be on display in the ERO Searchroom throughout August 2017. Recent tragic events have underlined the public desire to help those caught up in catastrophe. In the 17th century, when state and society commonly saw themselves as a single Christian entity, the characteristic expression of that desire was the brief. England had already invented social care. An Act of 1601 had created the parish poor rate, distributed in goods or money to the deserving poor. There were also charities providing food, fuel and housing. These initiatives, however, dealt only with ordinary needs. Catastrophic events involved another process, in which the state mobilized voluntary giving from society at large. The Crown, on petition, would issue letters patent allowing the gathering of contributions from ‘all well-disposed persons’. Individuals named in the grant would then employ collectors to carry the appeal around the country. The original handwritten letters patent, issued under the Great Seal, tend not to survive, but in a way they hardly mattered. The process really depended on the use of printing technology to make copies – ‘briefs’ – for distribution. The printed copies became so familiar that their title of ‘brief’ was applied to the whole process. This particular brief (D/P 152/7/2), from the parish records of Theydon Garnon, was issued in 1666 in aid of Melcombe Regis (Weymouth) in Dorset. In September 1665 the town had suffered a ‘sad and lamentable fire, wherein seven and thirty houses were utterly consumed’. Their occupants had been ‘brought to ruine’, the total loss being estimated at £3,055. Such fires were not uncommon. Much less usual is the note, in King Charles’s name, that ‘We Our Self was then present and an eye-witness of the said sad spectacle, and are thereby the more sensible of the said loss’. The King had indeed been in the West Country during that summer of 1665, taking refuge from the Great Plague in London. Some briefs allowed for house-to-house collections, but charity being above all a Christian duty, the normal mechanism for collecting the money was the parish, then both a religious institution and the foundation of local society. The clergy ‘published’ the brief at a Sunday service and exhorted their parishioners to contribute, the amounts raised being written on the back of the brief. 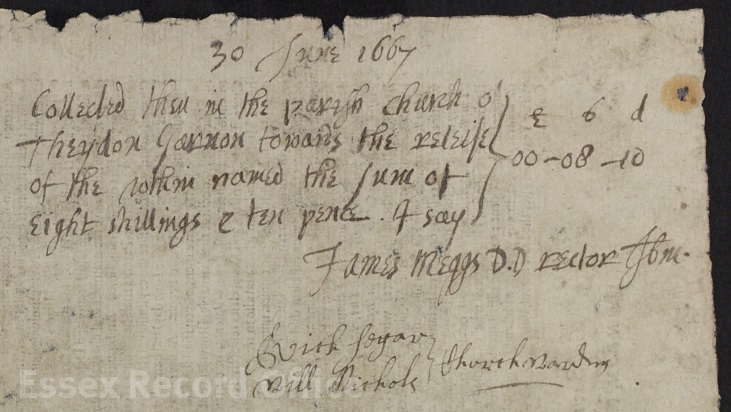 When this example reached Theydon Garnon in the summer of 1667 – almost a year after it was issued and almost two years after the fire – that one parish collected 8 shillings and 10 pence (for comparison, a few months earlier they had raised £27 5s. for the Great Fire of London). In this case they were to deliver the money back, via the appointed persons, to the authorities in Weymouth. They in turn were to ‘contract for the re-building of the said houses’, taking care ‘that none of them for the future be covered with thatch, or other combustible matter’. Not all briefs focused on local disasters. Many sought to rebuild churches – including, in 1632 and again in 1678, St Paul’s Cathedral in London. Others aimed to help whole social groups. From the late 16th century the objects of briefs included Christians taken captive by the Ottoman Turks, joined in the 1680s by Protestant refugees from the France of Louis XIV, in 1689-1690 by Irish Protestants suffering in the war between James II and William of Orange, and in 1709 by the ‘Poor Palatines’ from the Rhineland. Briefs like these expressed a Protestant national identity, yet in 1793 they were also used to help Roman Catholic clergy fleeing revolutionary terror in France. The system had obvious defects. Slow, cumbersome and costly at best, it was also open to fraud. Security measures such as expiry dates (one year, in this case) offered little real protection. The Essex Quarter Sessions records show evidence of prosecutions – in 1647 for collections on a wholly fraudulent brief (Q/SR 333/105, Q/SBc 2/35), and in 1653 for collections on what may have been a genuine brief by someone apparently unconnected with the parties concerned (Q/SBa 2/82). 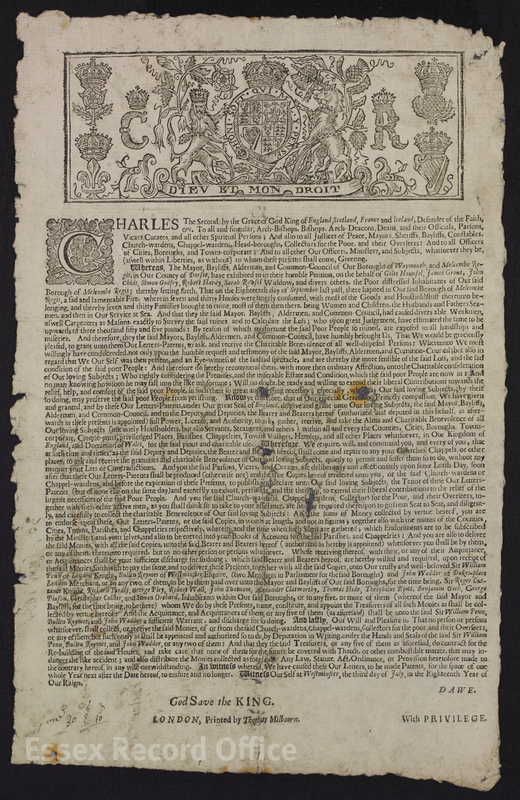 Eventually a reforming Act in 1705 tried to clean up the system, providing an elaborate system of registration, with all briefs now being printed by the Queen’s Printer. A handful of Essex parishes still have the registers of collections that the Act required. The earliest collections so far traced in the ERO’s holdings were in the 1570s, for the reinstatement of Collington (Colyton) Haven, a harbour in Devon. For that purpose in 1575 the little Essex parish of Heydon raised 6s.8d. ; Canewdon collected 1s.8d. in 1576/7, and then another 1s. two years later. Briefs continued to be issued even under the Commonwealth, but seem to have been at their peak under the restored monarchy of the late 17th century. Over time, however, fire and flood became matters mainly for the insurance industry, and the objectives of briefs were limited largely to church building. Briefs effectively came to an end in 1828, when responsibility for churches was transferred to the Incorporated Church Building Society. The need for large-scale relief funds eventually found expression in more secular ways. From the late 19th century many such efforts were organized through the Lord Mayor of London. The Titanic Disaster Fund of 1912 – later the National Disasters Relief Fund – was one of these. Mass media and then social media opened new possibilities, and online donation sites operate very differently from the state-sponsored briefs of old, but they draw on the same urge to help strangers in need. The document will be on display in the ERO Searchroom throughout July 2017.